The Panasonic NN-CT579S looks great, and works really well. Overall build quality is excellent, and it takes up very little space due to the slimline nature. Our testers loved the stylish brushed stainless steel design, and during our testing period it performed beautifully. The buttons are quite small, as are the labels. May be unsuitable for those with very poor eyesight as a result - however our test team did not experience any issues themselves, and for the majority of customers it will be fine. If space is of a premium, then you may well be interested in Panasonic's NN-CT579S slim line combination microwave oven - a claimed 20% slimmer than conventional microwave ovens, yet still offering a substantial 27 litres capacity, 1000w of power and an oven and grill facilities built in. This space saving design is ideal for those who have either a modest sized kitchen, or those who prefer a clutter free work surface in their kitchen. The overall design of the Panasonic NN-CT579S looks smart yet modern, with all of our testers being complimentary about it's aesthetics. It features the traditional left hand door, with the controls situated to the right hand side of the microwave. The controls are largely button based, which each individual one featuring a clear text label - a big thumbs up in our book, given our pet hate of poorly labelled or illustrated controls that some microwaves feature. The sleek silver colour scheme will fit right in in a modern kitchen, and the stainless steel exterior looks smart, but also has the added bonus of hiding fingerprints well, and so will be easy to maintain. This also applies to the interior, which features the same stainless construction - which will both be easier to clean, as well as more durable than the traditional acrylic lining that many other microwaves feature. In terms of power, the The Panasonic NN-CT579S Combi Microwave features 1000w when in microwave mode - The grill mode provides 1300w, with 3 settings and 6 different power settings. Unfortunately the two settings cannot be used concurrently - so if you need to both microwave and grill/bake a dish, then these will have to be set in separate cycles. It also features a convection oven, which during our test period cooked beautifully, again offering a maximum power output of 1300w - which equates to 220 degrees. It heats up impressively quickly too. The versatility of this kitchen appliance means that you will inevitably use your regular kitchen oven less - which should also save you money from your electricity bills in the long run. Normal oven dishes constructed from metal can be sued within this microwave, but only when you are using the convection oven - and not when in regular microwave mode. A handy baking rack and an additional metal tray are included within the package, together with the regular turntable. It's worth noting that retailers suggest to leave a minimum of 2cm around the microwave to help disperse heat - so it's worth adding this space to the exterior dimensions when measuring your kitchen to see if this model will fit in your designated space. The power lead is fairly lengthy, being 76cm from the appliance to the plug. As with most models in this range, the Chaos defrost system is included - essentially this sends a random sequence of waves towards the food item, thus ensuring a fast, safe and more uniform defrost. This is particularly handy when defrosting meat from the freezer, as unlike some cheaper models, the Panasonic doesn't partially cook the edges of the food, and results in a far more evenly heated up dish. We were impressed by the overall performance of the Panasonic NN-CT579S, as well as the overall size - quite how Panasonic have crammed such a large capacity within it's relatively small dimensions is a mystery. Build quality is also pretty good - the Panasonic NN-CT579S feels solid, as though it was built to last, and with Panasonic's reputation of producing decent appliances, we'd expect this microwave to stand up to the daily wear and tear for many years to come. As mentioned earlier, the Panasonic NN-CT579S's controls are easy to use, and clearly labelled - however it may not be suitable for the elderly or those with very poor eyesight, simply as the buttons are a touch on the small side - this is a minor issue, and for the vast majority of users, including our test team of varied ages, it won't be a problem. The clock display is pretty bright, and clearly legible in all but the brightest of sunshine. 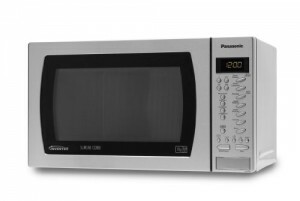 Overall, this silver microwave performs very well, and looks stylish - we'd highly recommend the Panasonic NN-CT579S if you can stretch to the price tag. There are cheaper combination microwaves out there, but considering the overall build quality and performance, our testers were unanimous in agreement that the NN-CT579S offers excellent value for money. Granted it is a substantial investment - however we feel it should offer a long life span and a more reliable performance than less expensive models on the market. It's probably best aimed at mid to large sized households, although the slimline nature of the Panasonic NN-CT579S, means it is equally adept for smaller kitchens too. All in all, it's an excellent and well designed combination microwave. The Panasonic NN-CT579S is an incredibly versatile machine - this microwave will end up replacing your regular convection oven and grill. From the easy maintenance stainless interior, Chaos defrosting system, to the handy baking accessories, Panasonic have clearly put a great deal of thought into this combi package. Granted, it's not the cheapest, but the build quality and performance makes it worth every penny. Given Panasonic's reputation, and the solid feel to the NN-CT579S, we envisage this combi microwave providing years of service. 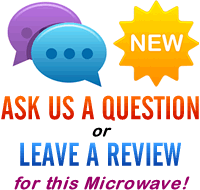 Highly recommended to those looking for a large combi microwave! Can this oven be built in so as to match the other appliances in my new kitchen? if not which oven would you suggest I looked at. This isn’t really designed to be built in, as it may overheat – however if you look here then you can find a selection of built in specific microwaves, all with reviews which will hopefully suit your needs. When used in convection or grill mode, does the outer case get hot or is it touch cool.? The exterior will heat up slightly during use – how much it heats up will depend on how much ventilation space you leave around the microwave – if it’s stored in a tight or surrounded area then it will heat up more, due to the heat not being able to dissipate effectively. Mine, purchased in January 2013, has just melted the plastic trim at the top of the door – lots of smoke and burning plastic smells. Seems to be working still and though I’ve sent photos to Panasonic and asked if It’s safe, no response so far. Over £100 to repair (new door) and who’s to say it won’t happen again so does anyone know of aNOTHER ONE THAT’S ALSO 40cm deep?